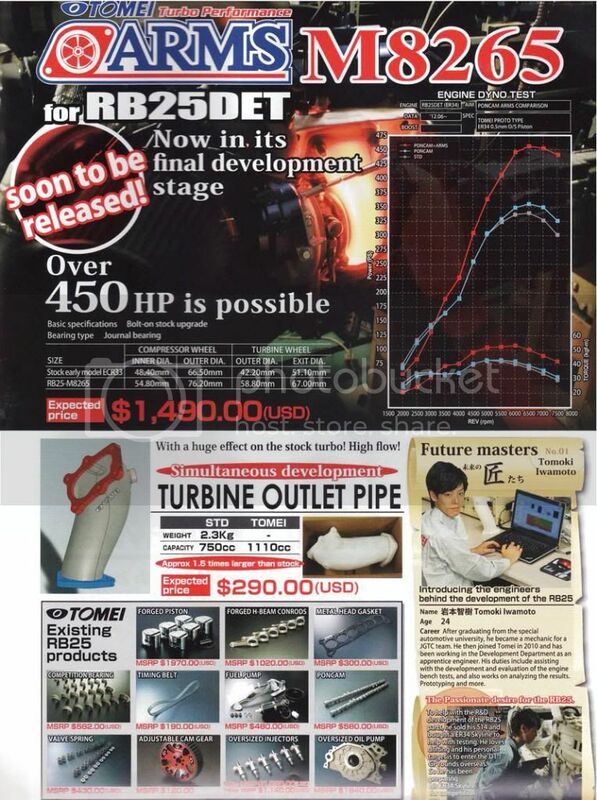 Tomei RB25 Turbo & Outlet Pipe - New Release! We just got word that Tomei is soon to be releasing a bolt-on turbo kit for the RB25DET! This beast will help the RB25 pump out over 450hp! As with all Tomei turbo kits, we expect this kit to be a full kit with all gaskets, bolts and lines for installation. It is priced at $1490 USD, which makes it very affordable. Also coming soon is a turbo outlet pipe, rated at nearly 1.5 times bigger than the factory piece. At $290 USD it's also an amazing deal. Don't forget Tomei already makes lots of great parts for the RB25 such as cams, pistons, rods, gaskets, bearings, injectors and more. And for those who didn't know, the Tomei RB28 stroker kit will also work in the RB25! RB28DET anyone? As an authorized Canadian dealer for Tomei, RightDrive will be selling all these parts, and we will even be taking pre-orders for the turbo kits and outlet pipes in the near future. I've been waiting for this! The SR kit my buddy had was gorgeous, so something reliable that I can bolt on for the 25 would be perfect. Do we know what boost they were running to get those graphs? There are no note as to the boost level on that dyno, but I would guess 1.2kg or so. Also I found out R32 RB20DET, R33 RB25DET run the same type of turbo outlet pipe, frontpipe, so should work on stock RB20DET turbo as well. Last edited by Skym; 04-26-2013, 11:02 PM. So is this turbo kit out yet? What is Tomei's idea of "soon"? Come on lotto!!! Daddy needs a whole lotta stuff! Hey did this kit get released yet?